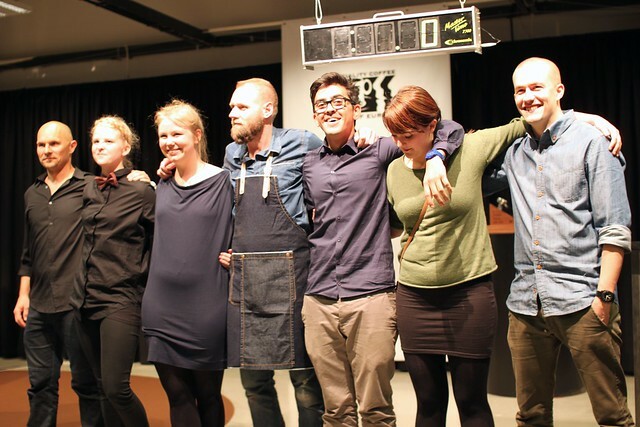 We're very happy and proud to say that yesterday Rasmus Gamrath, manager of our coffee shop in Torvehallerne, won the Danish Barista Championship! The presentation was centered around Rasmus' experiences of engaging customers in atypical setting of a Food Market (Torvehallerne), where people come for gastronomic experiences and not necessarily just coffee. In the past year and a half Rasmus has done an outstanding job in engaging people who never experienced really great quality coffee before. He used those experiences as a basis for his presentation. The four sensory judges were served a single origin espresso from the Kieni coop in Nyeri, Kenya. This is an amazingly aromatic and lively cup with clear black currant aromas. Those aromas also shined through in his cappuccinos, which becomes almost candy-like. His signature drink included a filter brew of a lighter roast of the Kieni (brewed on Kalita Wave), tonic water and the Kieni espresso - showcasing how the flavour is altered through different impressions beforehand. Rasmus has been with us since the opening of Torvehallerne and have worked in coffee previous to that too. 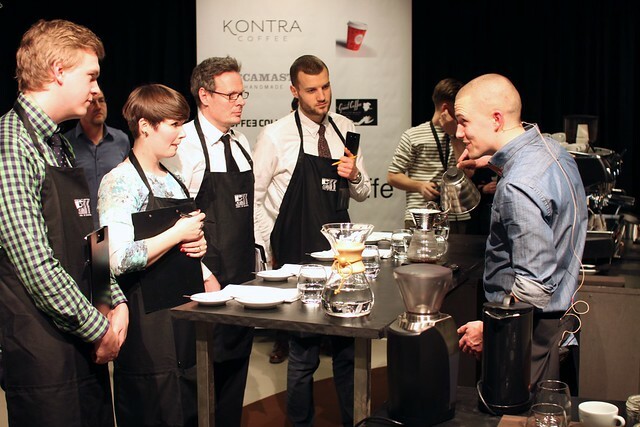 He's a very well known face on the Danish coffee scene and have been instrumental in organizing the popular Latte Art Throwdowns in Copenhagen. Next week Rasmus is going with Peter Dupont to Guatemala to visit Finca Vista Hermosa and El Diamante. This is his first trip to origin and comes at a very convenient time as he's about to embark on the training for the World Barista Championship in Melbourne in late May. 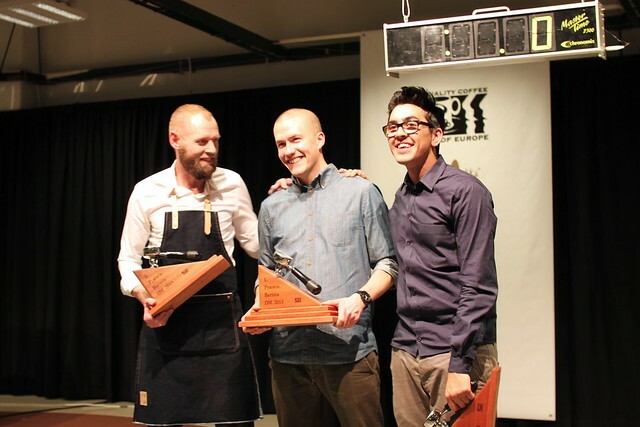 Second place went to Søren Stiller, who have placed both 5th and 6th in the World Barista Championship in previous years. To be up against such a qualified competitor was quite thrilling. Søren was using two natural processed coffees roasted by himself at Great Coffee in Århus, and his signature drink had little droplets of green tomato and blood orange juice frozen in liquid nitrogen. Also a big congratulations to our other collectivist competitor and finalist: Omar Maagaard Houssein, who placed third. His stunning presentation focused on Textures in coffee. Using a special espresso roast of our El Desarollo from Colombia, he created a 'Coffee Oyster' by a gelification process of grape juice, floating in espresso and a foam. Drunk just like an oyster it was a funny and thought-provoking experience in textures.